Steel vent covers feature a bar linear pattern for a clean industrial look. Linear grilles are easily attached to walls with matching hardware that is included. 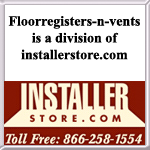 Steel vent covers are 1/8 of an inch thick offering structural integrity. The linear grille pattern is suitable for both commercial and residential applications. 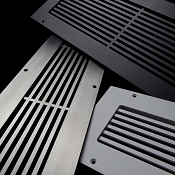 These steel vent covers are available with 5 different finishes and offered in over 80 sizes. Linear grilles are crafted in America and have custom sized options available. Tip: When ordering linear grilles always use the interior dimensions of the duct hole. For example a 12" wide x 10" tall hole will need a 12" wide x 10" wide grille. All sizes are width by height unless otherwise requested.The faceplate will then be larger based on the above table. Important: All steel vent covers, both standard size and custom size, will take 5 to 8 weeks to be manufactured and shipped. There are rush shipments (2 to 4 weeks) and beveled edging available for an extra charge (please call for information). All decorative air vent covers are special order, non-returnable and cannot be canceled once payment is received. If you're not sure about the best finish for your linear grille please feel free to contact us to request a color sample set. Metal color chips of the finishes can be sent to you for a small deposit and will be refunded once returned. You can coordinate your wall vents so the wall registers match. Check out our entire selection to complete your look. These linear grille steel vent covers are a great addition to any home or office, place your order today!